John Boyega was born on the 17th March 1992, in Peckham, London, England, UK, and is an actor, probably best known for starring in the films “Attack The Block” (2011), “Imperial Dreams” (2014), and “Star Wars: Episode VII – The Force Awakens” (2015). He has also appeared in several TV series, including “24: Live Another Day”, and “Tinkershrimp & Dutch”. He has been an active member of the entertainment industry since 2011. Have you ever wondered how rich is John Boyega, as of early 2016? According to sources, it has been estimated that the overall size of Boyega’s net worth is over $2 million, with the main source of this sum of money being, of course, his acting career in the film industry. John Boyega was raised by Samson and Abigail Boyega. He attended Oliver Goldsmith Primary School, and during studies there his acting career began, as he was spotted by Teresa Early, the director of Theatre Peckham, and he started performing in theatre shows at the arts centre in London. He went to Westminster City School, a high school where he featured in a number of school productions. He then enrolled at South Thames College, where he studied Performing Arts at the college’s Wandsworth campus, and while there he was cast in the main role in the production of “Othello”. He continued at the University of Greenwich, in Film Studies and Media Writing, but quit to pursue an acting career. However, he started earning money from his talents as early as 2011, when his professional acting career began by appearing in the TV series “Becoming Human”, in the role of Danny Curtis. The same year he made a breakthrough appearance as Moses in the sci-fi film “Attack The Block”, for which he won the Black Reel Award for Best Actor. Furthermore, in 2011 John appeared in films “Junkhearts”, and “Da Brick”. Ever since then, his career has gone only upwards, and so has his overall net worth, as he landed roles in such films as “Half Of A Yellow Sun” (2013), “My Murder” (2012), “Imperial Dreams” (2014), and also “The Wale” (2013). To speak further of his accomplishments in the entertainment industry, John appeared in the role of Chris Tanner in the TV series “24: Live Another Day” (2014), and in 2015 he lent his voice to Blkmrkt, a character from the animated TV series “Major Lazer”. 2015 brought him another memorable role, as Finn, a stormtrooper in the seventh film of the Star Wars franchise “Star Wars: Episode VII- Force Awakens”, adding further to his overall net worth. Most recently, Boyega was featured in the TV series “Tinkershrimp & Dutch” (2016), and he is to appear in the film “The Circle”, which is scheduled for a 2016 release. Furthermore, John will repeat his role of Finn in the “Star Wars: Episode VII”, which is scheduled for a release in 2017, and it will certainly increase further his overall wealth. Although still a young actor, John has already made several memorable appearances, for which he has won several nominations and awards, including the BAFTA Rising Star Award for his work on “Star Wars: Episode VII- Force Awakens”. Speaking about his personal life, obviously John Boyega keeps it private, as there is no information in the media about him. In free time he is very active across many of the most popular social media platforms, including Twitter and Instagram, on which he has over 900,000 followers. 1 Who wouldn't want to be in 'Star Wars?' It'd be great. 2 I watched season four of 'The Wire.' They have subtle performances that they do through their eyes. You could watch season four with the audio off and still understand what's happening through their eyes. 3 Some people feel fulfillment from a bitter end - it gives them some sort of sense of reality. But, when you're dealing with reality, I feel like films should discover the part that is happy. 4 You know, we all can do bad, and we all can do good. 5 You know, urban culture is fun; it's lovely. 6 Normally you hear about Southeast London, and you hear about all the stuff that goes on down there, all the negative things, and the tabloids kind of stay away from all the positive things that happen that I see every day, which kind of outshines the negative. 7 I've been acting since I was 5 years old, from primary school to secondary school, did training at drama school, which was the big thing for me because they trained me, put me out into the industry. 8 It's amazing that people still feel, 'Oh my gosh, it's a black guy.' We've been here for a long time; let's get used to it. Let's get used to other cultures. 9 In the States, you have a little bit of freedom to audition for different kinds of roles. 10 My biggest challenge is to not do urban movies for the rest of my life, those alpha hoodies. 11 I've had plenty of lessons about film acting and theatre acting. 12 'Junkhearts' is a great story. 13 In this life, it's not hard to do wrong. 14 Portray the world for what it is, and you will find truth. 15 The 'block' in 'Attack the Block' is not just a physical thing. It's people; it's families. 16 There's a difference between living somewhere and being part of somewhere. 17 The scripts that I've been getting are of epic proportion. People want me to lead the big armies. 18 There is a level of appreciation for brothers and sisters in the hood. 19 I've been getting diverse roles. 20 I love London. I'm a London fanatic. That's my city. 21 I'm a comic reader and a manga fan. 22 I'd like to be in anything that tells a good story and has an interesting character. 23 I'm a Michael Bay fanatic. 24 I like my women very green; you know, eco-friendly. 25 Being robbed hurts - not physically, but from what it does to your pride. 26 Hollywood has given me a great, warm hug. 27 I know my movies. I love my movies. 28 Film is just a great medium to express yourself and a great environment to work around. 29 Acting careers don't come out fully formed - not unless your name is Jaden Smith and your dad has done it all. 30 My dad's a Pentecostal minister, meaning that he's full of charisma. If he's telling a story about Noah's ark, you best know each tiger is going to be having their own little conversation and narrative. 31 My dad is a minister, and my mum is a worker with the less fortunate and the disabled. They're Nigerian natives. Their first language is Yoruba, and their second language is English. 32 I remember my manager telling me, 'Be myself, be humble, keep rooted, keep God first'. Those words were very helpful. 33 'Attack The Block' is an alien invasion film set in South London. It's about a group of kids who are some petty thugs, who have to find the hero in themselves, when they attack. 1 The son of Nigerian immigrants; his father is a Pentecostal preacher and his mother works with the disabled. 2 Was chosen by Screen International as one of the "UK Stars of Tomorrow 2011" and appeared alongside two other actors on the front cover of that magazine in its July 2011 edition. 3 Born and raised in Peckham, south-east London. 4 Began acting at Theatre Peckham, a local performing arts centre for talented children aged 9 to 14. 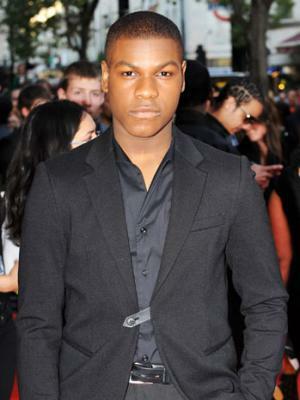 Boyega spent almost every day after school at the theatre, as well as weekends. At 16, he moved to South Thames College to study performing arts, and joined the Identity School of Acting in Hackney, London. He enrolled at Greenwich University but as his career took off, he left to concentrate on acting.